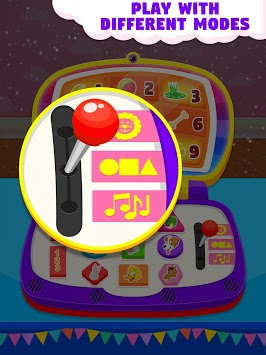 Kids Toy Computer is an educational game for kids and toddlers. Educational toys are objects of play, generally designed for children, which are expected to stimulate learning. A Great gift for any kid to enjoy as they listen to songs and play while you can rest happily knowing they are learning and getting ahead. And if it is in computer form then it will be amazing for kids learning while playing. 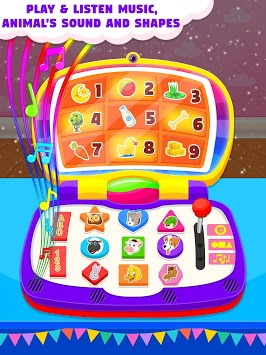 This Baby Computer or Baby Laptop objects of play, generally designed for children, which are expected to stimulate learning. They are often intended to meet an educational purpose such as helping a child develop a particular skill or teaching a child about a particular subject. They often simplify, or model activities and objects used by adults. * Explore and learn with the Kids Toy Laptop by us. this travel-ready toy laptop features nine brightly coloured shape buttons. * Learning Alphabets,Number,Shapes,Animals,Shapes Songs are there. 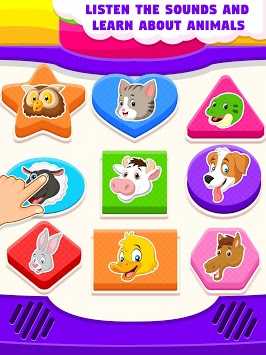 * Intended for ages 6 months to 3 years of kids with colorful graphics and jolly music. Come and play with FABULOUS FUN..